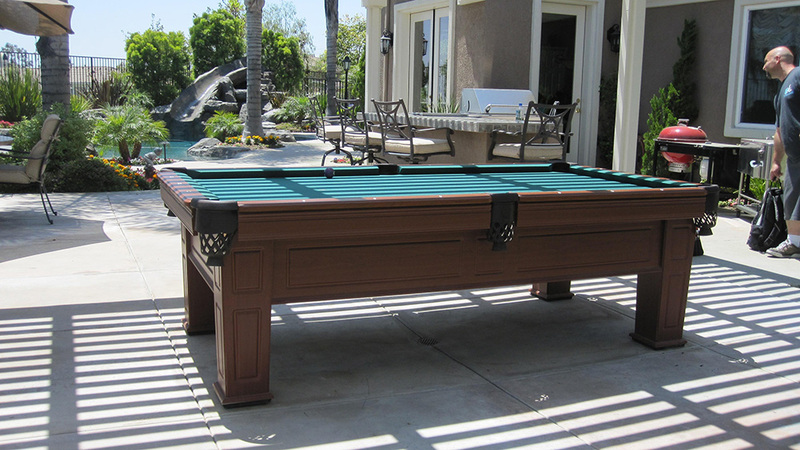 The other day we were called to a home in Orange,CA to relevel two pool tables. Not a real uncommon thing for us. 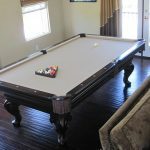 But, this particular customer had two pool tables on his property, one outside on the patio next to his swimming pool and one in an upstairs game room. 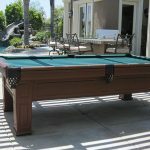 The outdoor pool table, he explained, was purchased from a pool table store, here in Orange. He went on to tell me that he was very unhappy with the service he received. He told me that when he and his sons would play a game, the balls would always end up drifting towards the center of the pool table. When I put my level on the end slate, I was flabbergasted. 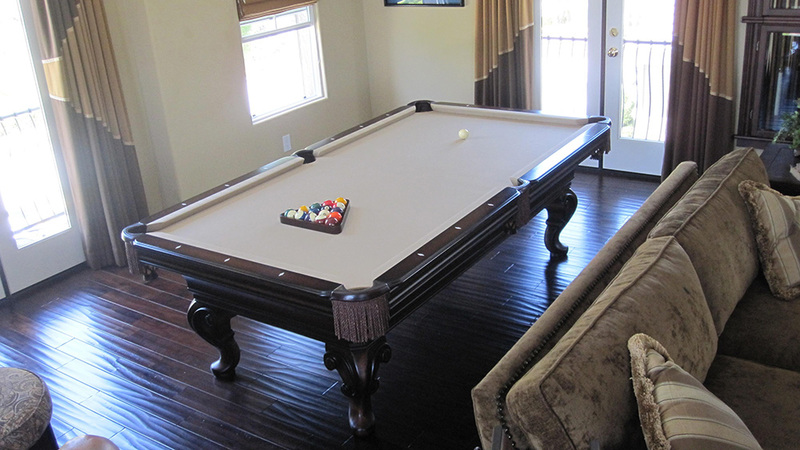 Now, I don’t know if this was a poorly designed pool table or a poorly installed pool table. But either way, this table needed major help. When we were done leveling the frame and slates, the balls rolled true in any direction. Next, we ventured upstairs to a beautiful game room. 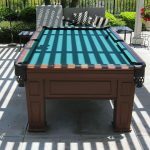 My customer was so dissatisfied with his outdoor pool table purchase, he decided to give an Orange County Olhausen dealer a try. This pool table was beautiful and I’m sure he spent a small fortune on it. What blows my mind, is the lack of skill that an installer uses to set-up a high dollar table like this one. For example, the side rails weren’t even closely lined up, so anyone attempting to make a long rail shot would never have a chance at succeeding. A ball traveling down the rail would be shunted out by the uneven line at the side pockets. This is just one of the annoying problems I observed. Upon further inspection of this poorly installed Olhausen, I noticed it was way out of level. Fortunately, the problem could be corrected by shimming the legs. Sorry if I get a little “heated”, when discussing inferior work habits. 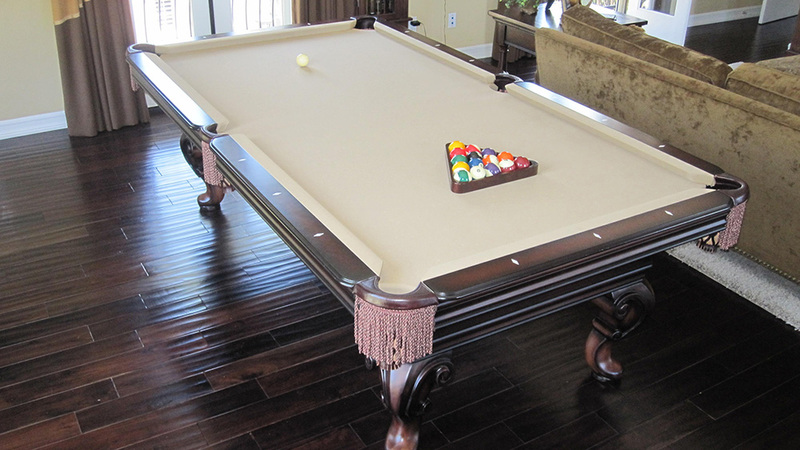 But I believe that if a person buys a high end pool table, the thing should play like a high end pool table. They didn’t even give him matching color chalk for crying out loud. Okay, I’ll get down from my soapbox now! 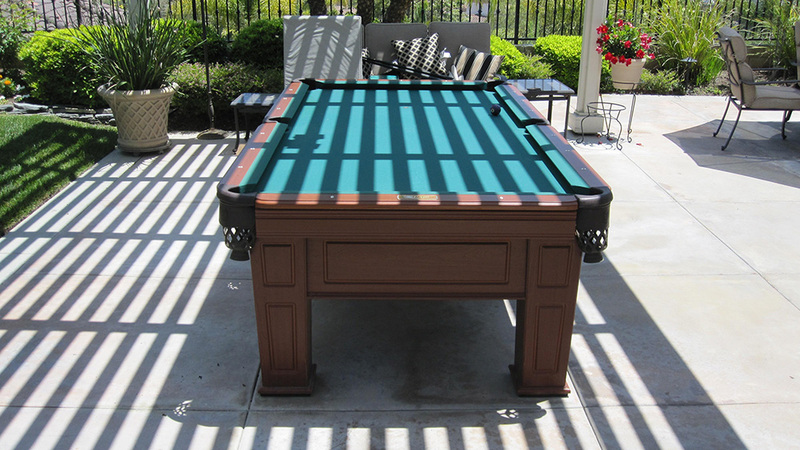 In the end, “Our” customer was very happy and could now enjoy “tournament” quality play on both of his pool tables.